We’re well on our way to the holiday season, a time filled with joy, friends, and family—and also stress. As we move through the next few weeks, let’s help each other. I’ll offer my gift ideas, and you do the same. It isn’t easy to pick gifts that everyone likes, but sharing our personal experiences, we can help each other choose presents that our friends and family will love. And less gift-giving stress is always a good thing. My friend Melissa (I told you about a cool instant camera I bought for her birthday) sent me an iced tea maker via Amazon.com for my birthday this year. I’ve been a tea drinker all my life, but making tea can be a bit inconvenient. This is especially true if you like your tea iced or if you prefer specialty, loose-leaf teas like those Teavana sells. Anyway, here’s some info about the automatic tea maker Melissa sent to me. 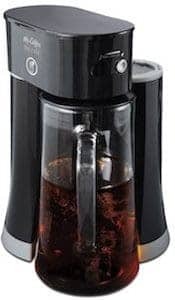 I really like mine, and I think it would make a nice gift for other iced tea lovers. Iced tea can provide a nice pick-me-up any time, but especially when it’s hot outside. It’s just a hassle to make. 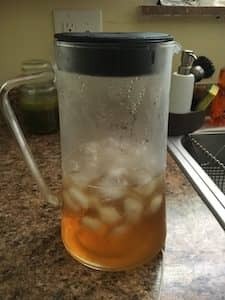 I drink hot tea more often because I can make it with hot water straight from the water cooler, but who has time to boil water, brew tea, and let it cool for iced tea? The Mr. Coffee 2-in-1, Available at Amazon.com, was a thoughtful gift by a thoughtful friend. 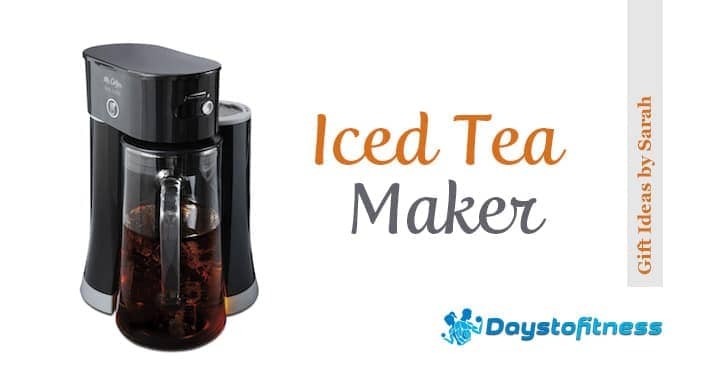 It solved the iced tea prep problem for me because it’s as quick as brewing a cup of coffee. First, I squirt water into the reservoir with my kitchen sprayer. The reservoir is clear, so it’s easy to see when to stop. Next, I add ice to the pitcher and tea to the brew basket. I’m partial to Teavana’s Peach Tranquility. Then, I stick the pitcher under the drip and press brew. A few minutes later—iced tea. When peaches are in season, I add them to the tea to enhance the flavors even more. Yum! Another of my favorite “recipes” is to make raspberry tea on the “strong” setting, then add calorie-free lemonade mix and a little water. The tea brews directly into a lovely glass pitcher, and the Mr. Coffee turns off automatically when the tea is done, so I don’t feel like I have to watch it. The pitcher is dishwasher safe and easy to clean (important! ), and the machine wipes off easily with a wet paper towel. This is not a fancy appliance, but it works really well and has been a tasteful (get it?) addition to my kitchen. For those of you who may be interested, it can use either loose leaf tea or tea bags, and it comes with a lid so your tea can go straight into the frig. 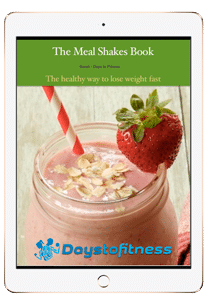 My regular readers will remember that tea is a powerful antioxidant superfood that fights free radicals, along with berries and grapes. As luck would have it, these fruits go extremely well with fresh-brewed iced tea. Happy shopping! 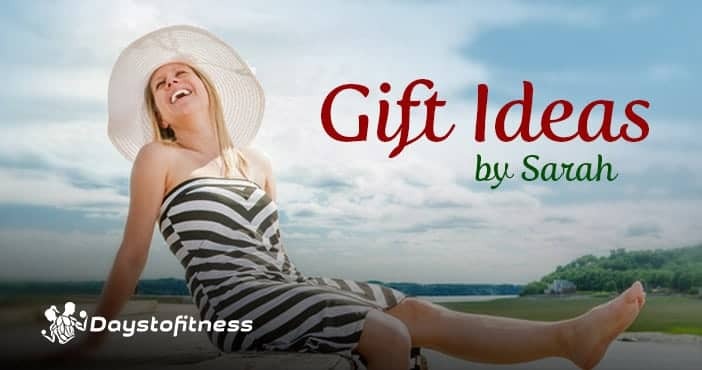 And don’t forget to share your gift ideas with me! Finding the perfect present isn’t an easy task, but together we can do it better. Gifts under $20, and gifts under $40 or gifts above $50: all my favorite gifts here. Thank for sharing! 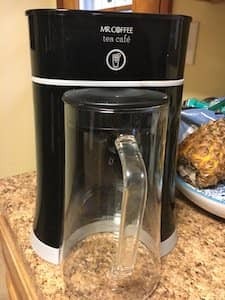 Do you think that we can use either use loose tea leaves or tea bags in this unit like the Mr. Coffee Iced Tea Maker? Hi Lita. Yes you can use both. Have a great day.